For over half a century, the members, staff, volunteers, and friends of Byakko Shinko Kai have taken part in a number of projects, all with a common aim — the realization of a world where people live as one, in peace with themselves and with the earth, in happiness and harmony, beyond all ideologies and all cultural, ethnic, and religious differences. The 7-21 Peace Project (known as Nana Ni Ichi in Japanese) is one of these special activities, involving thousands of peace-loving individuals who came to Fuji Sanctuary over a period of 14 years to silently write down prayers for the peace and the happiness of every country and region on earth. The 7-21 Project consists of writing peace messages for a particular country, in that country’s official language(s), inside each of the 7,100 frames outlined on a large 7 x 21 meter sheet of graph paper. Before writing a peace message, participants prepare themselves by spending a moment in silent prayer or meditation. Writing a prayer for peace on behalf of another country naturally opens up a loving connection with the people of that country, and an exchange of energy takes place. The energy generated by the people who have written these prayer words over and over for all the countries of the world has created an enormous pool of peaceful energy. The purpose of the 7-21 Project is to draw on this pool of energy to awaken the wish for world peace in the hearts of all people, so that one day they will come to pray wholeheartedly for peace in their own country, and ultimately for the peace of the world. 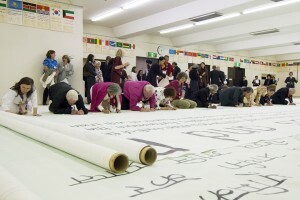 Since the activity was initiated in 1986, some 1.4 million peace prayers have been written on these enormous sheets of paper, which have been carefully kept in the main prayer hall at Fuji Sanctuary. Thus far, a total of 198 sheets have been completed for all nations and regions of the world, including formerly existing nations such as the Soviet Union and Yugoslavia. The project is considered complete, but if a new country comes into being, a new sheet will be created accordingly. We dedicate this page in gratitude to the thousands of individuals whose prayers continue to radiate the light-filled energy of love and harmony to people in every country and region on earth.